New Ends, Old Beginnings presents a unique opportunity to engage with particular contemporary visual practices which reflect on urban landscapes and lives in the contentiously coined Middle East region. 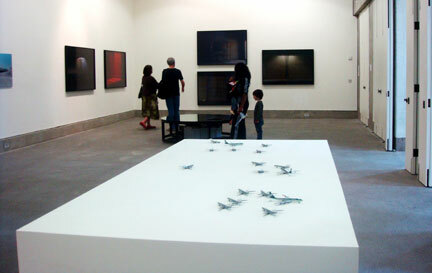 Organised in partnership with the Bluecoat gallery, Open Eye Gallery and Zenith Foundation, it is significant that the exhibition took place during Liverpool’s year as European Capital of Culture – a year when the city’s regenerated landscape receives critical scrutiny and when the global nature of its history is popularly investigated. In addition, the exhibition occurred in conjunction with the annual Liverpool Arabic Arts Festival. The festival is the only one of its kind in the UK, and celebrates local and international Arab culture through visual art, music, film, dance, literature and community events. Featuring artists from Turkey, Palestine, Iraq, Egypt, the United States, Syria and Lebanon who work and live in Beirut, Sharjah, Istanbul, Chicago, Paris, London and Cairo, the exhibition aims to give a personal, sometimes playful, sometimes political glimpse of the multiplicity of urban and everyday experience in the region. Instead of being identified as belonging to one geopolitical region, they were chosen for their work which reflects upon ideological, social, cultural and economic influences that continue to shape the contemporary cities in which they live and work. So it is without prescription that New Ends, Old Beginnings presents a timely meditation on some aspect of urban life in the Middle East and Arab countries.